John George Haigh. British (English) serial killer, known as "The Acid Bath Murderer". ALS. 2pp. Onslow Court Hotel, Queen's Gate, South Kensington. 31st May, 1948. To Mr. Rasbridge. "I thank you for your very sympathetic consideration of the case yesterday and for giving so much of your time to Pat. I am very grateful. I delivered him according to arrangements to Dr. Burns in Reigate tonight. Dr. Burns is I understand passing him over to Prof.r Salisbury tomorrow. I am still very interested in Pat's welfare of course and I hope that from time to time you will be able to let me know how he is getting on and particularly to let me know when he is finally put down. As I take it you will be academically interested in the case I am sending here his pedigree in case it should help you to complete your records. Again many thanks for your trouble you have taken and also particularly for the very interesting insight you gave me into the science of canine optics. Speaking from an artistic standpoint purely the vision of your own dogs eye through the ophthalmoscope was a really magnificent sight. 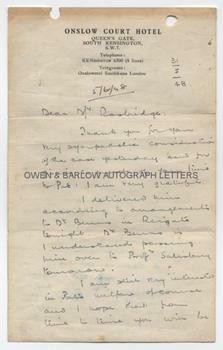 Yours sincerely, John Haigh". 8vo. Approx 8 x 5 inches. Filing holes and remains of mounting hinges at top edge (not affecting text). VG. John Haigh was convicted of the murder of 6 people (although he had confessed to the murder of 9) in London in the years following WW2. The case received worldwide publicity, principally due to the killer's method of disposing of the bodies, which he dissolved in acid, and the callous nature of the crimes. Pat, the dog referred to in this letter, had belonged to the Hendersons, a couple that John Haigh had murdered a few months previous to this letter. After shooting the Hendersons and disposing of their bodies, he forged a letter from them and sold their possessions for £8,000. He was living at the Onslow Court Hotel on the proceeds of this but had retained their dog, Pat, which he had formed an attachment to. 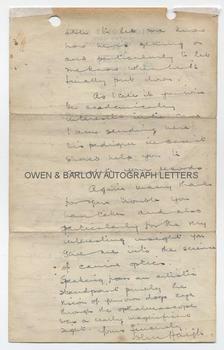 Eight months later, John Haigh was to murder another resident of the Onslow Court. John Haigh was apprehended when detective discovered a dry-cleaning receipt for his last victim's fur coat. He was convicted of the murders and was hanged on 10th August 1949. An extremely scarce crime autograph and one that is very seldom encountered in any form.